The Emerald Isle is known for its gorgeous countryside, and rightfully so. From the rugged cliffs of the Atlantic coast to the lush meadows and lakes of the interior, Ireland is rich in imagery both awe-inspiring and serene. The vibrant streets of such cities as Dublin and Belfast, where modern architecture rubs shoulders with Georgian townhouses and Norman stonework, testify to the island's 21st century resurgence as the cosmopolitan 'Celtic Tiger.' From the remains of a Bronze Age ring fort to the soaring modern Spire of Dublin to the stallions of the National Stud, Ireland is a land of surprising variety. The rich color images collected here weave together the portrait of a land where Paleolithic monuments, medieval castles, quiet fishing villages, and bustling cities all exist alongside each other. From the eerie, astonishing hexagonal stones of the ‘Giant’s Causeway’ in County Antrim to the cozy atmosphere of the town pub; from breathtaking wild landscapes to the exquisite gardens of stately homes; each page offers a new glimpse of Ireland’s multifarious beauty. The prehistoric tombs of Newgrange, the Gothic peaks of St. Patrick’s Cathedral, the sublime scenery of Connemara National Park, and countless country villages, all are here. 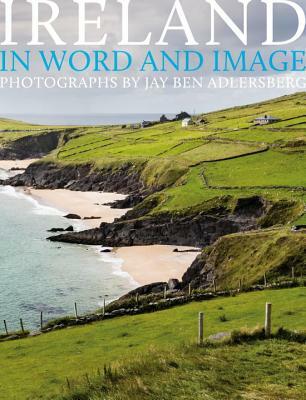 With a keen visual sensibility, Jay Ben Adlersberg captures the tiniest details and the most magnificent vistas that are at the island’s heart and that make Ireland one of the world’s loveliest places to travel—or to call home. Here, too, is a journey through Ireland’s history. The soaring modern Spire of Dublin monument, the elegant campus of Trinity College, the ancient seat of Ireland’s kings at Tara—each evokes a different moment in Ireland’s many-layered past. Written in the land itself, Ireland’s history appears here in the slope of a thatched roof, in the grass-grown remains of a Bronze Age ring fort, in a field tilled for centuries. Finally, here is the soul of a land where, out of the hardships of the past, have come arts and culture alive with creativity and resilience, from traditional flute and fiddle music to a diverse literary tradition from which thirty poems and literary excerpts have been chosen to accompany Adlersberg’s images, including the romantic prose of James Joyce; the humorous boyhood memories of Frank McCourt; the celebration of natural beauty in the poetry of W.B. Yeats; and the folk tales of Douglas Hyde; as well as numerous others whose writings capture the unique spirit that is Ireland. Samantha Bowser supplies the rich and nuanced captions for the more than two hundred photographs. Jay Ben Adlersberg is a contributing artist to Getty Images. His clients include Microsoft, Saatchi and Saatchi, Macmillan and The New York Times. He brings a journalist's eye to his images of countries and their people. He was inspired by his daughter, an editorial and portrait photographer in New York City, to pursue photography more seriously. Jay has been voted one of the Best Doctors in New York. For the past 30 years, he has reported nightly on medical news for WABC-TV, and--together with other ABC NEWS staff--won a Peabody Award for coverage of the September 11, 2001 attacks. EDITOR, Samantha Bowser is an avid student of history and culture pursuing a career in archival work. She has contributed to a number of Welcome titles including Exodus and Red Carpet. She claims Irish heritage through her father and was thrilled to travel in Ireland with Jay Adlersberg for the creation of this book. She lives in New York City. "Best Travel Book of the Year"
"Best Coffee Table Book of the Year"
"Finalist, Best Photography Book of the Year"
"Capturing Ireland in text and picture involves entering its soul; getting under its skin. This beautiful book somehow manages to achieve that intangible goal." "This is a beautiful publication which highlights the best of what Ireland has to offer. The stunning photographs capture all aspects of Irish life and everyone should have a copy." "The deep soul and spirit of this luminous country is evident on each finely wrought page of this book. A wonder to behold and to be treasured." "From the Happy Rainbow to the Flora and Fauna, the Majestic Buildings and the wonderful shots of the people the book evokes all that Ireland offers and more. A wonderful publication and an ideal gift." "This book is a must have for every Ireland enthusiast. Whether an avid armchair traveller or an intrepid explorer, this collection of gorgeous photographs and its compendium of great Irish Authors, poets and wordsmiths, highlights what make the Island of Ireland so unique and compelling for visitors." "What a stunning tribute to this island's landscape."